Poaching and habitat destruction are threats to the endangered black rhinoceros. To protect the rhinos, conservationists move them to private sanctuaries or other managed care locations. Yet once there and protected, they often develop health problems. One problem in particular is iron storage disease. This complex disease occurs when too much iron accumulates in the body. As a result, the liver becomes damaged, which can lead to illness and death. To determine the causes, treatment, and prevention requires hard work through research. Despite the need for more animal research, there is little funding available to award scientists to perform the study. Thus, our only hope in saving zoo animals and wildlife is for you to support the Wild Animal Health Fund. In South Africa, iron storage disease developed in rhinos recently relocated to protect them. This new risk to their survival became a research priority. The Wild Animal Health Fund gathered the resources to help veterinarians overcome this problem. The first step was to compare blood profiles between wild and captive black rhinos. 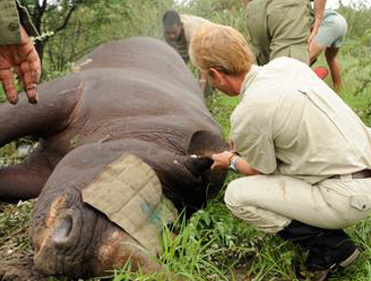 To do this, researchers collected samples from rhinos in habitats throughout South Africa. Other benefits have come from this work as well. Diet has emerged as a likely factor in this disease. Information collected on habitat is helping to guide the care and management of these rare animals. In addition, a significant accomplishment was the establishment of a regional laboratory in South Africa. This laboratory can analyze rhino blood protein using the highest standards. Staff in South Africa are now trained to track iron levels in wild rhino populations on their own. This capacity training ensures continued progress toward eliminating this disease. You can help by supporting with as little as $10 today to make a difference and prevent extinction. Donate now! Learn about zoo animals and wildlife from the people who take care of them. Sign up to receive updates.